Any avid reader of this blog may already have stumbled across the expression “spreading the risk” a good number of times. The more bets included in a portfolio, the more risk is spread to better effect, and consequently the deviation from statistically experienced distributions is smaller, leading to more consistent success. The same applies of course for bookmakers. The more customers, the more bets, the greater the diversification and spread, the smaller the variance, the stronger their betting book. The question now is how big is a bookmaker’s betting portfolio? How far do they spread their risks? Regrettably, bookmakers do not report their customer numbers and revenues, at least not to the public. Again, we must rely on estimates, and for this we are going to use the Alexa rank of various bookmaker Web sites. Alexa is a service which puts all Web sites worldwide into a ranking order. 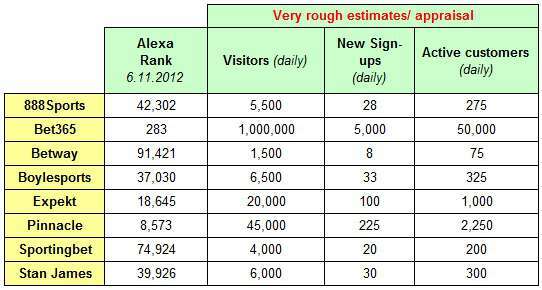 The more popular a Web site, the smaller the Alexa rank. Today, Google.com is the most popular site in the world according to Alexa with a ranking of 1, followed by Facebook in 2nd place. Wikipedia ranks number 6 in the list. Betfair.com is found at 1,097, and Soccerwidow is at position 243,159. Alexa seems to stop counting at 30 million and Web sites with a worse position than this display “n/a” (not applicable) in the Alexa toolbar. The Alexa rank is not only an indication of popularity, but it can also be used to estimate (roughly) how many visits per day a site attracts. For example, Soccerwidow’s ranking corresponds to around 500 visitors per day (Alexa rank 200,000 to 250,000). A few weeks ago, our Alexa rank dropped just for a couple of days to 190,000, but without any change in our visitor numbers. This shows that there are many sites constantly jostling for position, and no ranking algorithm is perfect. With these rough estimates it is now possible to estimate the number of new customer sign-ups the bookmaker receives on average per day as well as the number of active customers. Don’t forget, all these calculations are highly erroneous because firstly we are basing them on Alexa ranking and visitor estimates, and secondly, both new customer sign-ups and the number of active customers depend on a great variety of factors, such as the Web site design, its marketing, free bet offers, attractiveness of odds, presence on odds checking sites, etc. We have therefore assumed in the above table that from the daily flow of visitors each online bookmaker receives, around 0.5% register as a new customer and around 5% of the daily visitors are active (i.e. place bets, play online casino, etc). The remaining 94.5% of visitors are passive, accessing the bookmaker’s site to check odds, watch live sports, read their blog, etc. This figure also includes those users who ‘bounce’ within a short period of accessing the site. Of course, figures differ from bookmaker to bookmaker but nevertheless, the numbers provide a good idea of the size of the bookmaker for comparison purposes.